● LEOGEN PUMPS are designed special for portable application. Single stage centrifugal design pump casing and stuffing box is designed with inter changeable wear ring to reduce the hydraulic losses and improves the pump efficiency ( 86 % ),so low fuel consumption. Impeller is designed with cavitation free and low NPSHR, improves more suction lift and impeller life (closed / semi open ). Dynamically balance drotating assembly improves the life of bearings and vibration level is lesser than50 microns. Double mechanical seal is assembled in oil chamber which improves the life of the seal and safe from dry run. Shaft is covered by sleeve and closed impeller nut to protect from pumping liquid and solid particles which improves life of the shaft. 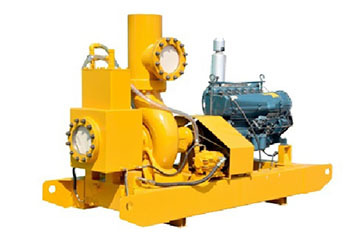 Pumps are assembled with two tapper roller bearing to with stand axial and radial load.